This is a true story, I kid you not. I know you’ll think I’m posting it because Halloween is coming up (but I’m not) because it’s weird and eerie and hard to believe—even for me—but it’s not particularly scary. Just hard to believe. Anyway, I digress. 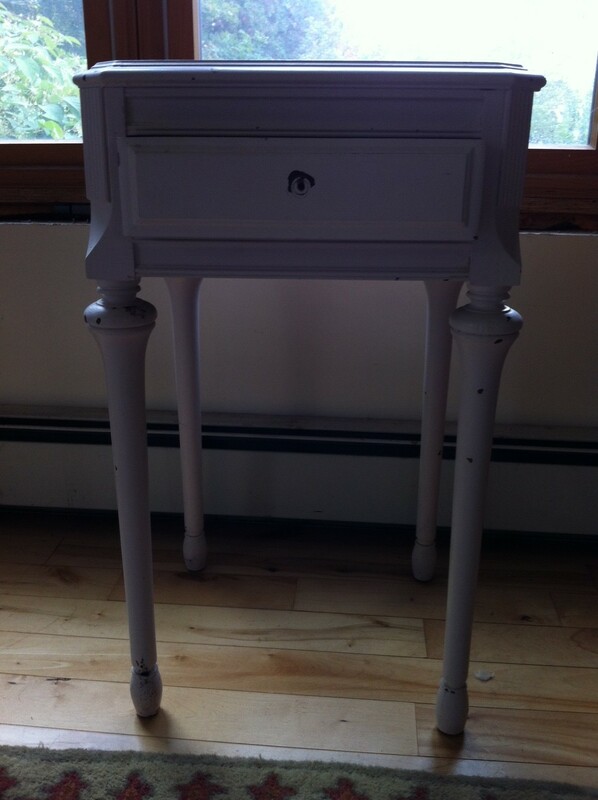 One of the reasons I was drawn to this particular end table was that it has a drawer—well I assumed it had a drawer when I bought it. From the photo, I think you can plainly see why I thought that. But here’s the thing. I couldn’t open it at the yard sale. I bought it anyway, figuring I could pry it open when I got home. But even when I got home, I couldn’t open it. I tried screwdrivers and metal paint spatulas, figuring it was painted shut, but no luck. I felt fairly certain there was a drawer (and not just a fake drawer front) because I could hear something rattling as I carried the table home and there’s that hole in the front—where a knob should fit. MEH (My Engineer Husband) tried, the dog even tried (okay, Abby didn’t really try, but you get the point). We even tried to pull the drawer open by tying two toothpicks together with dental floss, then pushing them inside the drawer pull opening and pulling on the floss. Wouldn’t budge. Finally, I kind of gave up, deciding it was either a false front or glued shut. Over the years we’ve used the table for a variety of things—picked it up and moved it wherever it’s been needed. Each time, I’d hear the rattle inside and each time I’d try to open to no avail. Instead I was always left wondering: what’s inside? But I never had a chance to finish because just then the drawer slid open. Slid all the way open. Just like that. Smooth as can be. 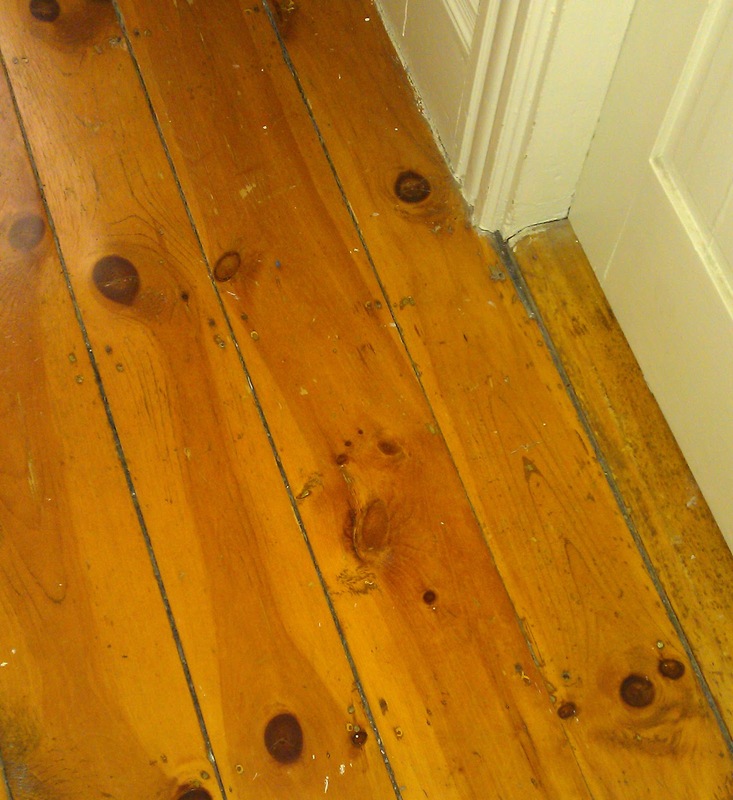 As the drawer opened, one small nail—with traces of wood and white paint—dropped out onto the carpet. MEH and I just stood and stared, first at the table then at each other. 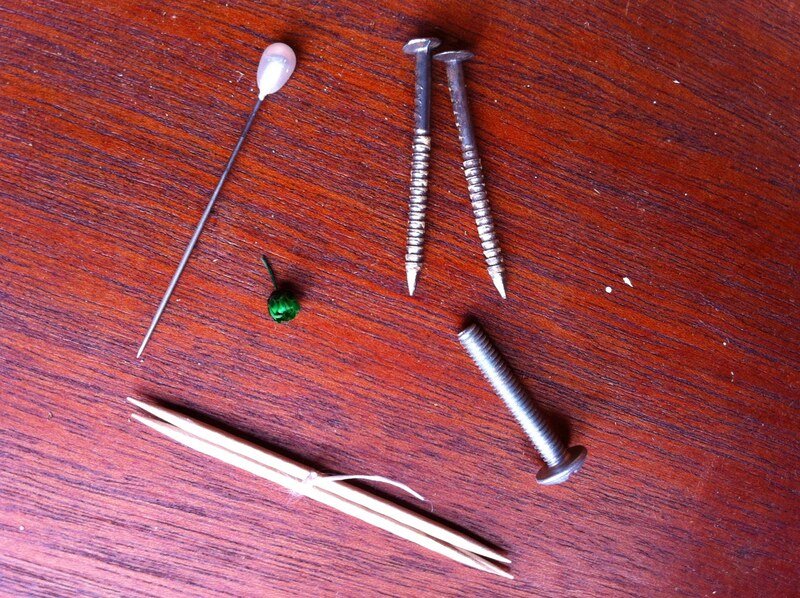 I set the table down and finally got a chance to see what was inside the drawer: a second small nail (also with traces of wood and white paint), a screw (assumedly to hold in the drawer pull), a tiny dried green flower, a hat pin, and those two toothpicks tied together with floss. I was disappointed at first. I was disappointed. I’m not sure what I expected, but I did feel slightly let down. I mean, no old coin, no rusty key, not even a secret love note. Then MEH—the one who usually never says anything like this—asked if I could see any nail holes. Did the nails just get removed? Did someone or something sneak into our house and remove them? Is that why the drawer slid open? I doubt it. Whatever the reason, I’ll tell you this. I’m not closing that drawer until I get a drawer pull put on. Because I’ve got an old coin, a rusty key, and a love note I want to put inside. What would you have liked to see in the drawer when it slid open? Have you ever had an unexplained event in your life (with furniture or anything or anyone else)? around the corner from my house. Today I will attempt to answer questions you are curious about. No, not those of you who visit (and read) my blog on a regular basis and ask me questions. But you, the other ones—and you know who you are—those of you who find my blog via a google search, one that is perhaps only tangentially related to my blog. One that, when I read it, makes me smile, shake my head, or just plain wonder. 1. typewriter smudges: Is a typewriter smudge something left behind by a ribbon? I’m guessing it’s something you want to remove, right? If the smudge is on your skin, try fingernail polish remover; if it’s on the paper, I’d go for the white out…do they still make white out?…For the record, I once wrote a post on a typewriter, and it has plenty of smudges, so don’t feel bad, it happens to everyone. It’s part of the charm. 2. creepy church: One of my posts had photos of a church up the street from where I live; I take a lot of photos of it to help me establish a mood for my WIP. If you want to use one of my photos, I’m honored. But please ask first. but please consult your veterinarian if you have real concerns. 4. Is it okay if my dog eats the peanuts I feed to crows? My dog Abby eats them (shell and all) and she seems fine! Of course, she’s a lab. Please consult your veterinarian if questions remain. 5. Hermione mug: Did you find one? Please tell me where, I want one too. 6. man stuck in a rowboat: I’m sorry, I hope you got out. If you didn’t, try calling the U.S. Coast Guard. Immediately. You could get cold, see #8. 7. How to make a bridge out of toothpicks:One time my daughter built one of these in middle school. It was a huge pain to make, but it was beautiful. And she got an A on the project. She gets a lot of A’s. 8. Is 1 degree cold or hot weather: Do you spend too many hours of the day in your house, in front of your computer? I’m not sure how you don’t know this, but 1 degree (either Celsius or Fahrenheit) is considered cold, yes. Please go outside next time your thermometer says 1 degree and live the cold (but Mom says wear a jacket). 9. Iphone low battery: I have this problem too, so if you found a solution please come back and tell me. 10. antic house: The definition of antic is an attention-drawing, often wildly playful or funny act or action. I live in a quaint antique house, and there’s nothing funny about it. And I honestly think I’d prefer to live in an antic one—it sounds like a lot more fun. 11. Oprah waving: I wrote a post about Oprah and Meredith Vieira, and how I want to be interviewed by them when (for the record, I refuse to say if) I get famous. I don’t want to see Oprah waving, I want her to give me a hug like she gives all her guests. And yes, I admit a bit of a girl-crush on her (and you too, Meredith—just in case you’re reading!). 12. 8 meh: I only have one MEH (My Engineer Husband). But he’s as good as 8 regular MEHs any old day. He’s a keeper. p.s. What are some of the weird searches that got people to your blog? I’d love to hear in comments! And if you have more questions for me, leave them….I’ll try my best to answer them. This is Part 2 of The Ghost of Mr. Able. If you missed Part 1, you can read it here. A door leading from the office to the back yard stood ajar, a slight breeze blowing in, shifting the papers on the floor. Was that cigarette smoke I smelled? Then I imagined—or did I?—Mr. Able standing behind me. A shiver ran down my spine as I nervously glanced over my shoulder and moved a step closer to MEH. After that first day of exploring our old house, life got busy. The house was a mess, and we spent the majority of our time cleaning and repairing and (of course) visiting Home Depot. The life of the old house owner. Mr. Able’s office was by far the easiest to clean: we collected and recycled the papers on the floor and threw away the parrot—but not before MEH (My Engineer Husband) made up an elaborate story about how it was a signal to German spies that Mr. Able was a sympathizer. As for the phone, we threw that away too because it never stopped ringing. We assumed it was Mr. Able’s international business colleagues who hadn’t yet heard the news. But it was still creepy. And although I always got a distinctly uneasy feeling every time I went in there, and I always smelled the lingering cigarette smoke, I couldn’t just stop going in. It became a handy storage area for boxes that couldn’t be moved into rooms we were painting. We dubbed it the “Big Window Room” because, as you may have guessed, one of the walls had a big window. The Big Window Room, built by Mr. Able in the ‘70s looked and felt wrong with the character of the house—which was built in 1895. The day after we threw away the phone, Mr. Able’s attorney called me, explaining he was closing the file on the house. He had been out of town at the time of the house sale, and the entire process was completed by mail through a title company. So we had never met him. “Have you had any problems?” He asked me, more as a courtesy than anything. I asked about the coal stove. Why was it gone? He apologized that it was missing, but he really had no idea why it was removed. “It’s just that….” I tried to explain, but the more I said, the stranger it sounded. Even to me. Finally, I gave up trying. The attorney ended the call by telling me how he and Mr. Able had been friends for a very long time, since they were both young men. The cookies? I was surprised they had made such a big impression on Mr. Able. The attorney and I said goodbye and parted company. I thought maybe after the call things would get better. But they didn’t. Nothing ever felt right about the Big Window Room. Somehow, I always felt like I was trespassing. And the door would swing closed at the most unexpected times, usually when I was inside getting something out of a box, then it would lock shut behind me. It had a different key from the rest of the house, so it was exasperating to have to go out the back door and all the way around to the front of the house. I called a locksmith to change it, but he said the whole lockset would need to be replaced to match the other keys in the house. We decided not to do it. Eventually we just took off the doorknob. I’d like to say that the strange sounds and goings on happened only in the Big Window Room, but that’s not exactly true. It’s an old house, and there are always sounds to hear: the floors creak, the plumbing clanks, drafts come in and give you goose bumps. When MEH and I were downstairs late at night or early in the morning, we heard footsteps coming down the stairs or doors closing upstairs. We always thought it was one of our kids waking up and coming down. But it wasn’t always. And, maybe it was coincidence but every time we put anything in the Big Window Room, something would go wrong: boxes got damp and mold grew on everything, the door to the outside blew open and leaves blew in, and the skylight leaked and water streaked down the walls. One day I went in and a family of chipmunks had taken up residency in a box of my grandmother’s old table linens. Another day, I went in only to find the floor covered with dead flies. And it was always me who found these things. And I always, always smelled the cigarette smoke. And here’s the thing: I was the only one who smelled it. MEH, always the engineer, tried to explain: the skylight leaked so of course things got wet and moldy, only I smelled the smoke because I’d grown up with a smoking mother so I was very sensitive to it, the house was old so it creaked and the doors closed and got stuck or locked by themselves. Anyway, we had bigger fish to fry: the entire house’s electrical system had to be upgraded, one of the chimneys had to be rebuilt because water was leaking in around the roof, the furnace had to be upgraded, and all the floors needed refinishing. And we hadn’t even started on the kitchen—which was old, dirty, separated from the rest of the house, and much too small. It was a source of constant frustration to me. So one day MEH told me he had a plan: there was a small laundry nook off the kitchen, and directly behind that nook, if you broke open the wall you’d be in the Big Window Room. MEH’s idea was to integrate the Big Window Room into the kitchen. Then we’d have room for our kids to hang out and watch TV in close proximity to the kitchen. Plus, with the light from the Big Window, the kitchen would be brighter. He convinced me this was a great idea. I wasn’t so sure. The Big Window Room? An integral part of my life? But MEH? He was so sure. So we called a contractor, and he came to look at the old office and the garage. He did not encourage us (in the least). To say we were taken aback would be an understatement. A small kitchen do-over was turning into a tens-of-thousands-of-dollars renovation. Not unheard of for old houses, but I kept thinking about that room, why that room? It wasn’t even that old. But the more I thought about it, the more it was what I wanted to do. I convinced MEH, it didn’t take much: rip it down. Start over. Get rid of every trace of Mr. Able and the tumbledown Big Window Room. And that’s what we did. In the fall, the bulldozer came and removed Mr. Able’s office. Every last stick of it. It was all gone. In its place we built a new family room attached to the kitchen. I’m not so sure MEH is right, though. I don’t believe in ghosts, but I do sometimes wonder why. Maybe Mr. Able didn’t want anyone in the office, just like the first time we were in the house. Maybe I’m more sensitive to these things than MEH is, maybe I spent more time in the room than anyone else so I noticed things, or maybe he just felt more comfortable with me because of the cookies, like his attorney said. Whatever the reason for my own connection with Mr. Able, I’d like to say that when the Big Window Room was taken down, the other noises stopped too—but they didn’t. Late at night or early in the morning, we still hear someone coming down the creaking stairs, closing doors, and rattling the pipes. Earlier this month I wrote a post about what it’s like to write from a “strong sense of place”—how, in an old town, history trails behind every building. Somehow, out of that blog, came a request—and a promise—for a ghost story. Through this post, I attempt to fulfill that promise. Although I call it a ghost story, I don’t really believe in ghosts. Or do I? After you read this story, you tell me what you think. When you live in an old house, like I do, there are certain things you just accept. For starters, when you sign the contract: the deed may say the house is being conveyed from just one individual to another—but that’s not at all true. The truth is, when you go into a contract to buy an old house, you are agreeing to stand in a long line of previous residents. You agree to walk the floors they walked, peer through the same windows, weed and water the garden they planted. Before we bought our old house, it already had a long succession of owners: from the woman who built it in 1895 to Mr. Able who lived in it until shortly before we moved in. But I need to start at my beginning. When we first moved to this small town, there were no old houses for sale. Don’t ask me why we had kind of an obsession with buying an old house, but we did. Something with character, personality. When I lamented the lack of “antique” real estate to a friend, she suggested we do what she did: approach people who owned houses we liked and ask them if they had any interest in selling. Initially unsure about this personalized, rather aggressive method of finding a house, I checked with a realtor friend who said it was pretty commonplace. Even my dad—an old-house owner himself—said that he had lost track of how many people had approached him with offers over the years. So, I convinced myself (and MEH—My Engineer Husband—who was even less enthusiastic than I) that it was a great idea. And I honed in on the one house I had secretly coveted ever since moving to town. It seemed like fate, when the very first time we drove by after making the decision, that an older man—I’ll call him Mr. Able—was there in the driveway, unloading groceries from the trunk of his car. We pulled over, got out of our car, and started chatting—eventually working around to the topic of how much we admired his house. Within seconds he asked if we wanted a tour. We were ecstatic! Mr. Able told me to lead the way, to feel free to explore, while he followed a respectable distance behind. I felt self-conscious going room-to-room, trespassing on Mr. Able’s personal space—but he didn’t seem concerned at all, instead seemed to welcome the company. Although the house had “good bones,” it was hard to see how the years of neglect covered up a century of beauty. To say it needed work would be the understatement of the century. With each new room we entered, my heart fell. Old yellowed wallpaper stained by years of cigarette smoke—it reeked!—was the least of the problems. The kitchen was vintage 1960 schlock and the vinyl floor probably hadn’t been washed for five years. That’s okay, I thought, he smoked and hated housework. Not that unusual. I was much more concerned that there was a small section of the house Mr. Able patently refused to show us. A closed door led from the kitchen to what Mr. Able described only as “his office.” The tour stopped abruptly at that door, and after several coughing spells, Mr. Able lowered himself to a kitchen chair and waved his arm toward two others. We sat. For fifteen minutes, Mr. Able told us about his life—interspersed with frequent coughing fits, followed by several seconds of Mr. Able barely catching his breath—how his wife left him, how he bribed the local police department to keep his son out of trouble, that all he had left was his work as an international expert in nuclear power generators, and how his latest project required him to crack the whip with the “lazy foreigners.” After that, the conversation spiraled downward to embarrassing sexual innuendos and stories of dens of inequity around the world. In short Mr. Able was a seedy character, and I sat silently listening, wondering where it was all leading and whether it was all worth it. He was possibly the most unappealing person I had met in my life. I could tell MEH (My Engineer Husband) felt the same way, his arms crossed, looking toward the door. Yet we laughed obsequiously at his jokes, asking questions, repulsed yet fascinated, and of course with the house always in the back of our minds. Finally, after what seemed like an eternity, Mr. Able’s mood changed abruptly. He stubbed out his latest cigarette and leaned forward in his chair, resting his elbows on the grubby kitchen table. We were taken aback, it was the first time the topic had been openly stated. MEH and I exchanged glances. “I’ve always admired the house…” I said. We nodded. The staircase was pretty spectacular. We weren’t so sure about the coal stove; it took up half the kitchen. We wondered what to say. We hadn’t considered this possibility. “Make me an offer.” Mr. Able stared at us across the table and repeated his statement, almost as a challenge. Without thinking, I blurted out a number close to one that my friend had paid for her house several streets over. We both started to protest, but he waved his hands at us to shush. We weren’t sure what to say—deer in the headlights comes to mind—but I felt a pang of unease as he matter-of-factly discussed his demise. Shortly after that, we thanked him and left. 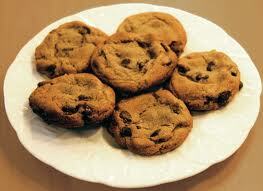 The next day I baked some chocolate chip cookies and took some over to Mr. Able to thank him for the tour of his house. When I dropped them by, alone, he thanked me profusely and invited me in. I declined. The next few weeks were a flurry of activity as we set the wheels in motion. Believe it or not, that one tour of the house with Mr. Able was all we ever got. It turned out Mr. Able was in a bit of a financial fix, and the bank owned the house. If we hadn’t accepted the terms in the will, the next step was a public auction. Part of the terms were that we accepted the house “as is.” And so it was, fool hardy as it seems, the house was ours, every messy inch of it. Although the bank removed all personal possessions, all fixtures were to stay with the house. The daughter wanted nothing. But everything didn’t stay. The day we moved in, we realized that the large free-standing coal stove had been removed from the kitchen. Gone. It was a moment of surprise, remembering Mr. Able’s fondness for the stove. We joked momentarily that he took it with him. Then, seeing my face, he stopped. 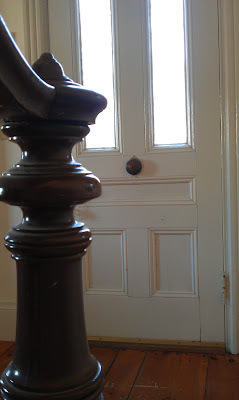 We continued to explore the house, and we finally got to see what was behind the door Mr. Able excluded from our original tour. It led to a short dark hallway with two more doors: one led to the small old crumbling garage. The other to a cold, dank, vinyl-floored office, papers scattered across the floor, an old black telephone still connected to a wall socket, and a red, yellow, and blue stuffed cloth parrot hanging in the window like a greeting card. As I stood there all I wanted to think about was how much work it would be to clean it all up, but that’s not what I was thinking. A door leading from the office to the back yard stood ajar, a slight breeze blowing in, shifting the papers on the floor. Was that cigarette smoke I smelled? Then I imagined—or did I?—Mr. Able standing behind me. A shiver ran down my spine as I nervously glanced over my shoulder and moved a step closer to MEH. I live in an area that’s been long-settled, with a long mist of history trailing behind each building. As you drive down the roads and thoroughfares, you can almost see the ghosts: the tall masted schooners by captain’s homes, the workers trudging to the lumber mills, the passengers waiting at the old railway station on Main Street. The buildings remain, leaving stories in their wake. Living and writing in an area of long established structures and abodes of historical significance—as in Maine—has its upsides and its downsides. One of the upsides is that there is an endless source of stories: from the historical buildings and their surroundings, from the stories of the people who built the houses or lived in them through the years or the people who still own them as a long-held family house. This strong-sense of place can lead to setting-centric writing; this is my natural tendency anyway—part of my search for what feels like home. Although I’m a relative newcomer to Maine (“only” 14 years, take my word for it, I’m viewed as “from away”)—I often find myself writing as though Maine is truly my home; that I belong here; or that I long to belong. As I write, I tend to describe in great detail what a house looks like as well as the feelings it evokes in the person who lives in the house, in a supporting character visiting the house, or in the casual eyes of a passerby. In some things I’ve written, the house even becomes the main character. In tomorrow’s blog I’ll explore the strong sense of place derived from a natural setting when I look at how the coast of Maine inspires my writing. Do you write in an historic place that is distinct in its own voice? Does it affect how you write or what you write about? Is your writing driven by setting? Or is it character driven? Plot driven? Action driven? Or some combination? My garden promises that spring is coming. Winter lingers in Maine, and it meanders. For a few days, it might be 50 degrees, then the next day we’ll have snow. But now, after the surprise 8 inches of snow on April 1st, we’re rounding the final corner into Spring. Sometimes you need to know what to look for, but the subtle signs are everywhere, and the garden is awakening. The view out my office window is changing, and I am both inspired and distracted! that are not nearly as sweet as their cultivated cousins. branches of a bouquet we bought at the grocery store last Spring. Now the branches are coming to life! I suspect this is a mole hole. 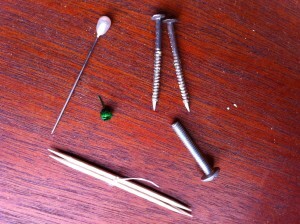 the little critters (at least I may get a good blog out of it!). (the same one featured in the wordsxo blog heading). the beautiful purple blossoms that will soon surround this old house. perimeter of this lot. Beautiful and fragrant! 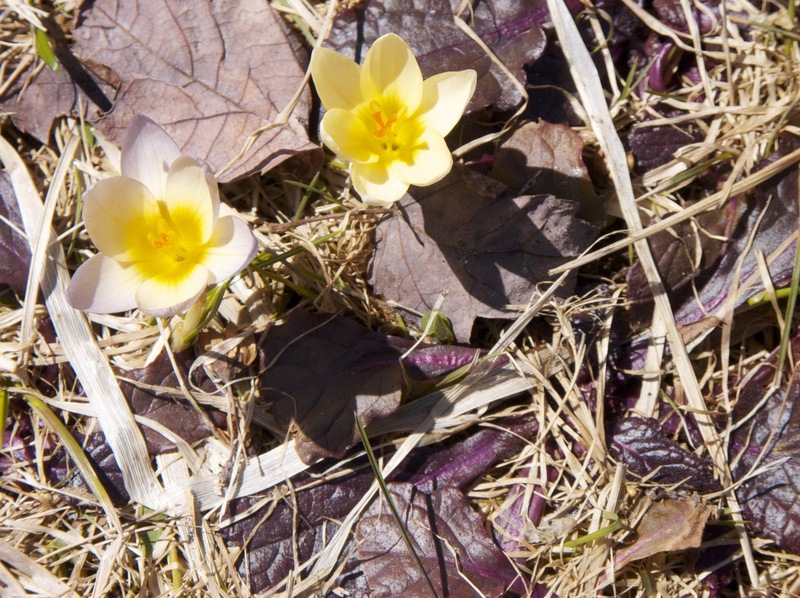 What are your subtle (or not so subtle) signs of Spring? Or is it already full-blown summer where you are? How does the weather and change of seasons affect your writing? p.s. The quote I featured in today’s blog was written by Hal Borland, who lived from 1900-1978. He wrote books and editorials about the outdoors, and like me, he lived in both Colorado and New England. He is a kindred spirit, as evidenced by the title of one of his books: Sundial of Seasons. When we moved into our old house, one of the first things I did was visit our Town’s historical society. I quickly became friends with Ms. Historical Director—who knew more than I could believe about the history of the Town, the Portland area, and basically the history of everything. Ms. Historical Director is “wicked smaht,” as a Mainer would say. She directed me to the Cumberland County Registry of Deeds in Portland, the largest city in Maine. For those of you from larger states, I add this: the total population of the State of Maine is about 1.3 million; the population of the whole “metro area” of Portland is 220,000, Portland proper is only 64,000, my town is 8,500. Yes, small, very small. The Registry of Deeds is an amazing place. Huge books dating back to 1760—way before my house was built. If you’ve never done research on deeds, you should try it. It’s fascinating. Here in Maine, each property has a book and page number. And each book and page refers to the previous deed’s book and page number. It’s like a treasure hunt. The place was bustling, with realtors and tax attorneys and historians…and probably other writers, too. As always in such places (you’ve read about my fascination with libraries), I need to work to stay focused because I’m like a kid in a candy shop—so many possibilities! Not the least of which is my curiosity about all the people; who are they? what are they doing there? Many looked like they had permanent stations, like desks they came back to each day! In the end, I spent all afternoon looking at deeds and so much more pertaining to my house’s ownership over the years: mortgages, contracts, liens, and mapping plans. What I discovered is this: the house was built in 1885 by a woman, and it has had fourteen registered owners, sometimes passed down through generations as shown by a sequence of owners with the same last names. I also found out who owned the land before the house was built—whose name is now my street’s name! I went home, thinking about Annie T., the woman who built her house, my house: now I know whose initials are etched in the glass of my front door. A return trip to Ms. Historical Director helped me find out that Annie worked in one of the mills in town; it makes me happy to be living in a working woman’s house. I thought about Fred and Molly S., who in 1903 bought the house from Annie T. and lived in their house, my house, for almost 30 years, raising a family. Fred was a train conductor and Molly a nurse. Are you, like me, fascinated with history of place? Do you enjoy doing research? Have you researched the history of an old house or another place? What are your favorite stories about research? Wabi-sabi: a beauty of things imperfect, impermanent, and incomplete. It is a beauty of things modest and humble. It is a beauty of things unconventional. One particular garden bed, right outside our kitchen door, really needed help. It was overgrown by the most beautiful Siberian irises. But it also had the craziest patchwork of other plants: some Pot of Gold, Antique Bleeding Hearts, Ajuga, Lady’s Mantle, but mostly the overgrown but still beautiful irises. I had a vision of a kitchen herb garden, and I started out strong, planting three big clumps of chives, transplanted from our old house. I knew the lilac-blue of the chive blossoms and the hollow tubular leaves would go beautifully with the intensely blue irises and their spiky leaves. But then I got stuck. I wasn’t so sure what to do because I didn’t want the crazy quilt, “Clown Pants” garden I was stuck with, but I am also not a hater or a killer of anything green. Plus, this garden was old, old, OLD. Like the house. With a lot of history. Which is what I wanted, right? A friend of mine—an artist and an amazing gardener with a fabulous eye—lives right around the corner. I got up my nerve, and decided to call and ask for her help. Boy was I nervous. Her yard is absolutely beautiful. And perfectly cared for. With lovely river rocks forming the driveway, each individually placed by the artist. And if anything looks out of place, I assure you it’s by design. Her garden is also her palette, I reminded myself, and each journey begins with a single step. I picked up the phone. “How ‘bout this afternoon?” She jumped at the chance! I wondered how much weeding I could get done before she arrived. That afternoon, I stood in the garden, side by side with the artist. This is not a talkative woman, rather reclusive by nature. And we stood silently, taking it all in. Her arms folded over her chest, finger gently tapping on the sleeve of her work shirt. Whew! Then back to the silence. Finally after what felt like hours, when I couldn’t stand it anymore, I asked her what she thought. Since then, every summer as I contemplate the peeling paint, the withered plants that haven’t made it through a brutal winter, the deadwood in the lilacs, the invasions of volunteer Maple trees, the creeping weeds and grass—the reality of gardening in an old garden in Maine—I work hard to embrace the Wabi-Sabi. At the same time, I try to forgive and appreciate myself (and all my gardening predecessors) for all we can (and cannot) do. p.s. Is there anything wabi-sabi in your life? Do you embrace it or does it drive you crazy? Are there ways that Wabi-Sabi can be incorporated into our writing lives? This week I was reminded of Wabi-sabi when I read Melissa Crytzer Fry’s blog: End of Mighty Saguaro. Then, when I searched the web to clarify my memory, I was surprised to find an article posted this week at Mother Earth News about Wabi-Sabi!